The thin-film startup plans to use the "fairly sizable" round to begin commercial production. The company hopes to bring its first films to the market in 2010. Stion Corp., a stealthy thin-film startup that raised $15 million last year and an undisclosed amount in 2006, plans to close its third round at the end of this year, Frank Yang, manager of business development, told Greentech Media on Wednesday. He didn’t say how much it is seeking in its Series C round, other that to say it would be a “fairly sizable” round in the double digits. But the company expects the cash will be enough to launch it into production, he said. San Jose, Calif.-based Stion expects to bring high-efficiency thin films to the market in early 2010, after developing a fully working prototype late this year or early next year, Yang said. It plans to build a 5-megawatt pilot facility in 2009, then complete its first commercial line – with the capacity to produce 25 megawatts of films – a year later. Stion then plans to expand by duplicating that 25-megawatt line, he said. Founded in 2006, the company claims it will be able to reach lower costs per watt than other solar-electric technologies. It is targeting costs of $3 per watt for fully installed systems by 2011, which equates to 15 cents per watt-hour in the United States, on par with conventional electricity, Yang said in a presentation at a Greentech Media conference in Massachusetts. While Stion lost a startup competition Wednesday, judged by three venture capitalists at the conference, two of the VCs said they liked what they heard from Stion. “I like the approach, in spite of the mystery magic [material],” said Jay Fiske, a partner at the Massachusetts Green Energy Fund, a Greentech Media investor. Jeff Andrews, a partner with Atlas Ventures, said he liked the quality of the people involved with the company. 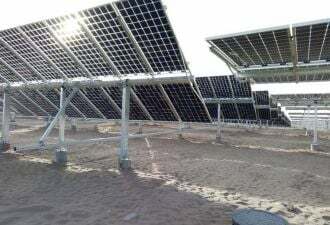 Stion was founded by Howard Lee, a solar researcher who established a reputation at California's Lawrence Livermore National Laboratory, and its CEO is Chet Farris, former president of Shell Solar. Stion has been super secretive about the material it is developing. Yang would only say that its quantum-dot technology has theoretical efficiencies of nearly 20 percent, and that it’s an inorganic material capable of making multi-junction cells. Multi-junction cells consist of different layers that capture different parts of the sunlight spectrum, potentially converting more of the light into electricity. Yang said Stion expects its mystery material to be able to reach higher efficiencies than many traditional crystalline solar cells. The company plans to eschew new equipment in favor of high-volume low-cost deposition technologies already on the market, he said. It also plans to put its films on glass, matching the panels on the market today, and expects to target large rooftop systems of between 500 kilowatts and 1 megawatt, he said. Stion expects its first product to have conversion efficiencies – the amount of sunlight that is can convert into electricity – in the “mid to low teens,” which would beat the films on the market today, he said. First Solar has achieved average efficiencies of 10.6 percent, according to Piper Jaffray. But other startups – such as HelioVolt, which announced it hit 12.2 percent efficiency earlier this month – also expect to surpass that percentage once they reach the market, and First Solar isn’t standing still, either. Yang said Stion’s technology can reach theoretical efficiencies as high as 33 percent in single-junction cells and 50 percent in multi-junction cells. Most technologies achieve 40 to 50 percent of their theoretical efficiencies in commercial production, he said, indicating potential efficiencies of between 13.2 and 20 percent. The company has set a goal of 15-percent efficiency with its first generation of cells and 20-percent efficiency with its second. Still, the company acknowledges it faces some risk. “It’s a new material, and to sit here and try to predict 100 percent is impossible, but we’re certainly trying to do our homework as much as possible,” Yang said. And Rob Day, a principal at @Ventures and the author of Greentech Media’s Cleantech Investing blog, said he was skeptical. Investors in Stion include Lightspeed Venture Partners, General Catalyst Partners, Khosla Ventures, Braemar Energy Ventures and Moser Baer Photovoltaic. The company also is in the process of hiring a chief financial officer, Yang said, and expects to announce new technical hires next week.